It’s that time of year when the good old British picnic is upon us. Sports fixtures are coming at the diary from all angles, the girls are travelling off here, there and everywhere with schools and clubs, and festivals of all kinds are in full flow. And to top it all off the sun is shining (well, for now anyway)! I’m not a fan of soggy sandwiches and I have serious picnic-envy when I look around and see Tupperware being pulled out of bags full of yummy goodies more exciting than mine! So I fancied a bit of a change in the picnic hamper this year. 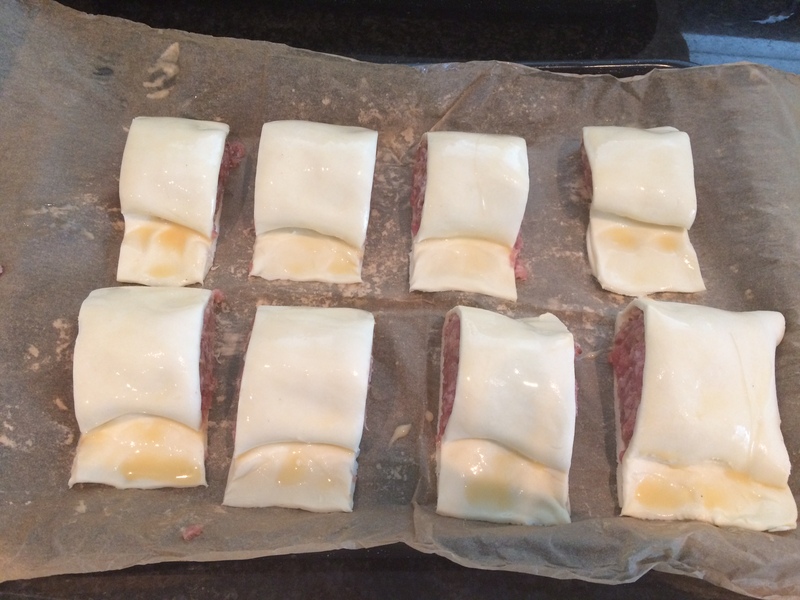 The girls are big fans of the humble sausage roll and I thought I’d have a go at making some myself ready to take to a 20/20 cricket match in Arundel we were off to recently. These picnic-babies really are so easy to make, I promise. I don’t have time for fiddly recipes and I have a couple of cheats along the way that make them even quicker, so all in all these took me about 15 minutes to prepare and then just needed to be popped in the oven. Oh the smell of them baking is amazing let me tell you! 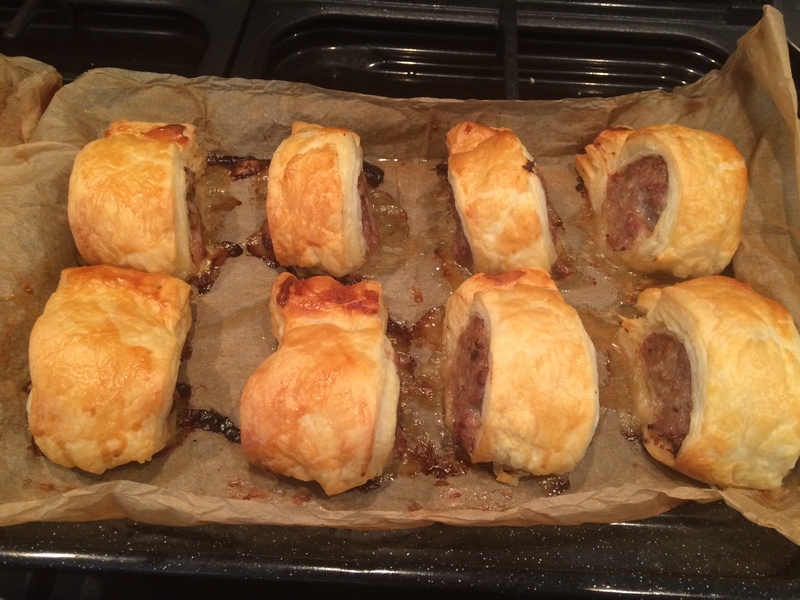 I based these sausage rolls on Jamie Oliver’s Sausage Roll recipe, with a few of my own tweaks here and there and the addition of a couple of secret ingredients (never to be disclosed to the kids unless they read this). I also made double the volume (as shown in the picture below) as I have the time-saving ethos, one for now one for the freezer…except that none of these made it to the freezer they were so yummy! Step 1: Chop your onions finely and fry gently for 5 – 10 minutes until they are soft and translucent, you don’t want to brown them really, just soften. Allow to cool for a few minutes before using in step 2. Step 2: Put your sausage meat in a bowl, add cooked onions and squish together with your hands (I confess I find this bit a little icky, I’ve always been a bit squeamish about handling meat, so I have some disposable gloves at hand for these occasions!). 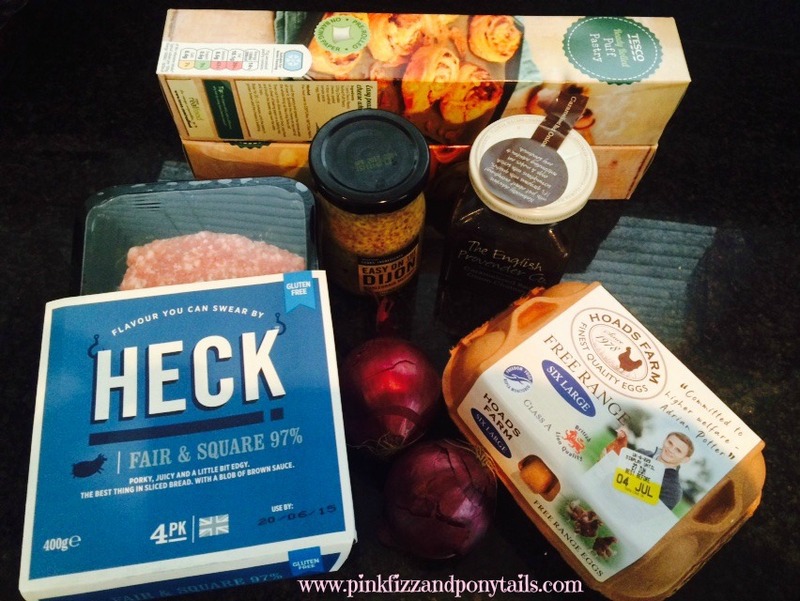 Step 3: Add your secret ingredients – mine are two things that I had hanging around in the fridge begging to be used – caramelised red onion chutney for a little sweetness, and wholegrain mustard for a bit of a tang – these are both great accompaniments to pork in any kind of recipe so work well in this one too. 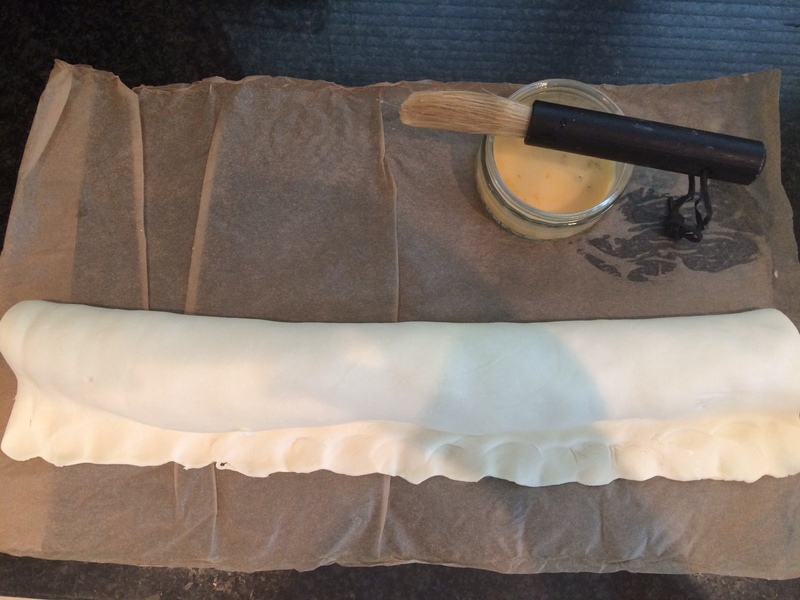 Step 4: Place some greaseproof paper on a baking tray and add your ready rolled puff pastry. Mix the egg and milk together and brush over the pastry (this will help the edges stick together later). 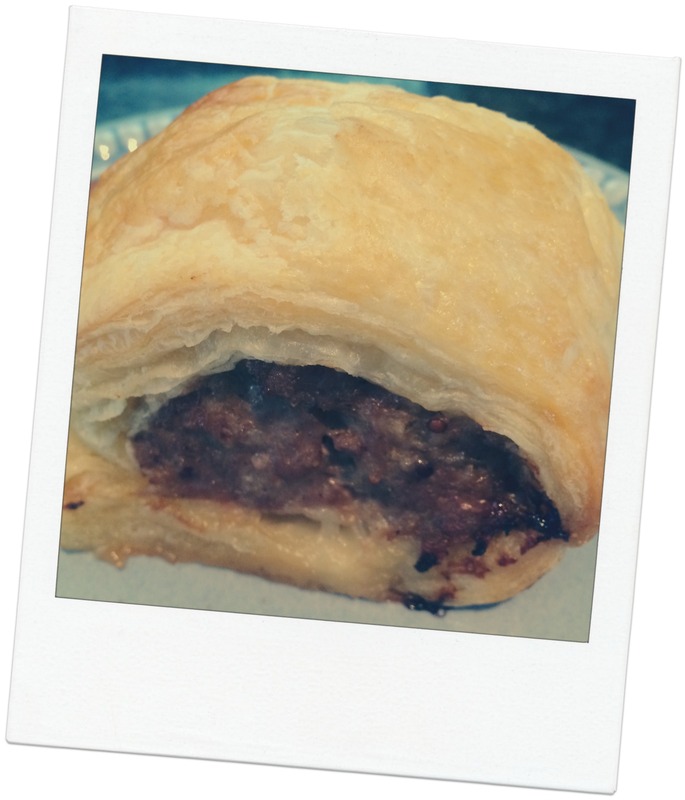 Step 5: Add your sausage meat in a long sausage shape all the way along the middle of the pastry – see below. Step 6: Fold the pastry tightly over the sausage meat and trim the excess, but leave enough to press the edges together and with a bit of space for the sausage meat to expand a little as it cooks without busting the pastry open. Brush with the remaining egg/milk wash. 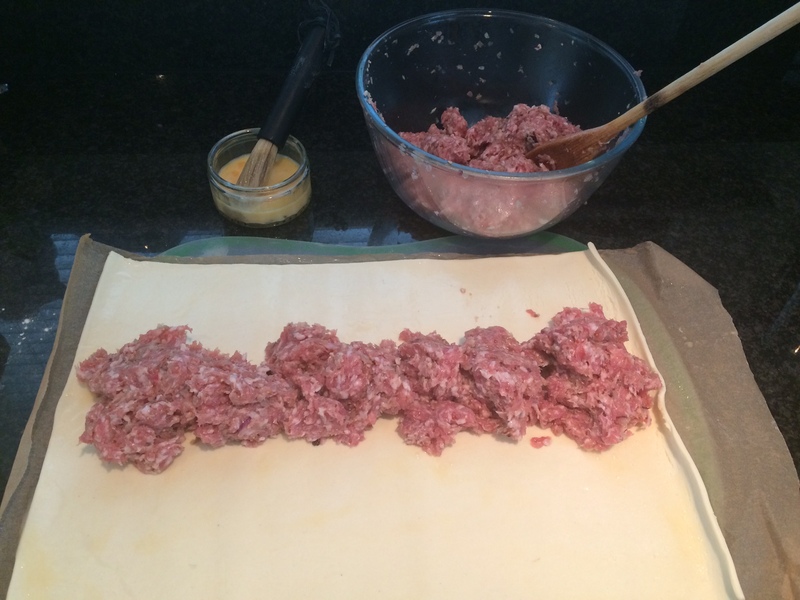 Step 7: Cut the now giant sausage roll into smaller sausage rolls in the size of your choice. Step 8: Place in oven for around 25 minutes until golden brown and bubbling. Cut one open when you take them out to check the pork has cooked through the middle (and then sneakily, for scientific reasons of course). Ta-dah, you have the perfect homemade sausage rolls ready for your picnic, outing, or just for a delicious lunch in the garden. Perfect accompaniments are a gorgeous tomato salad, some Branston pickle and an ice cold beer. Mmmmmm. There really is nothing better for a great British summer’s day. And you can finish off with a slice of my quick, delicious and nutritious banana cake, or one of my amazing rock cakes which I’ll be adding here for you soon. « What is blogging anyway?